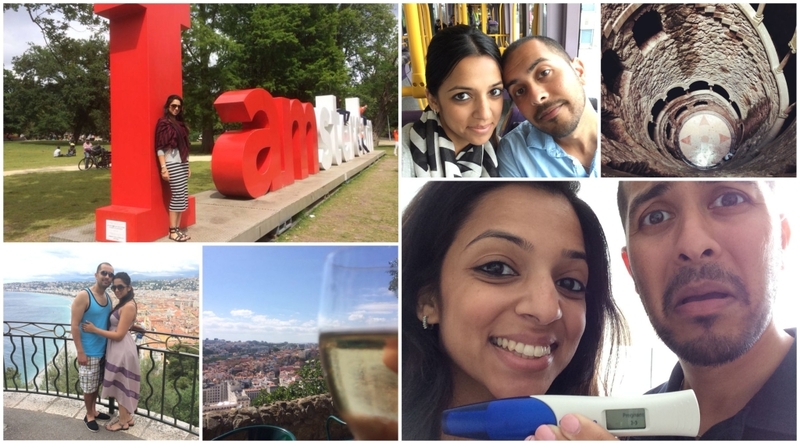 Last week we made an exciting announcement about Dipti & Sachin’s little one on the way. And today we want to share that these lucky two are having a baby…..BOY! (We know, we know…another Dedhia boy joins the clan). They have lovingly picked a cute nickname for him, Bobo! 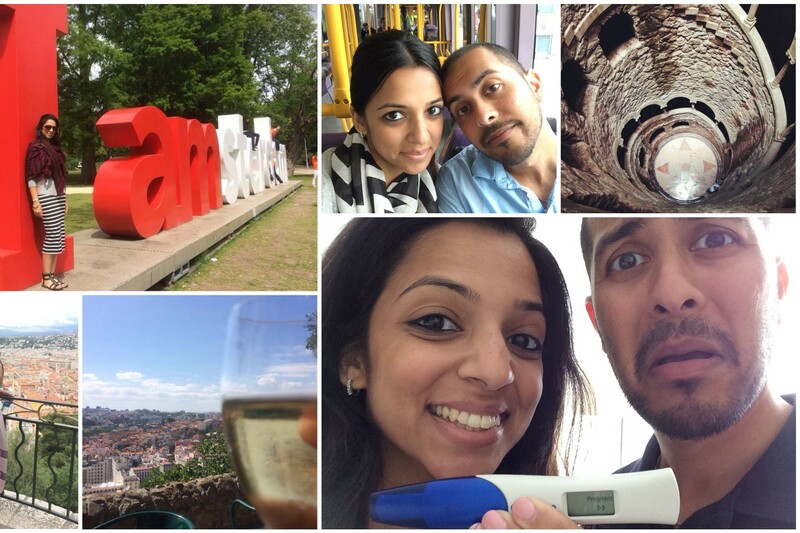 Dipti wanted to start her “Pregnancy Diaries” series with a recap of her and Bobo’s first trimester. She will be updating us monthly on the baby, herself, the family and of course, her fashion! We hope you all enjoy this series as much as we will enjoy sharing it with you. The name “Bobo” comes from his sister, Naya, who had the cutest video where she’s screaming “bobo” and looking as cute as ever! Finding out about Bobo was as dramatic as I love life to be! We were in the middle of our Euro trip with our closest friends. As most people know, I am deathly afraid of deep waters, so when they decided to sail around Croatia in a boat, I was a hard pass. So instead, we decided to split from them and go to Portugal for a few days. I had a random thought to just take a pregnancy test because I was late (which meant nothing at the time because that’s the norm with me). The first one we took was in Portuguese so you can imagine our bewilderment when the test said “gravida.” Three tests later, we finally believed that we were going to be parents! Finding out in “Lisboa” confirmed that “Bobo” was the right name for him! This little nugget went from the size of a lentil bean to an avocado in just a few weeks! Side note: I can definitely relate to Rachel’s “I can’t see the baby” moment because I could not see anything during our first ultrasound. But by 16 weeks, I saw a head with eyes and a nose, a body with arms and legs, and heard the most beautiful sound in the world – his heartbeat. The first trimester was full of headaches and an almost nonexistent appetite. I was very fortunate to not have gotten any morning/evening sickness but Bobo definitely made up for it with the mood swings and blinding headaches! Not to mention, while Bobo took his time growing, he was completely draining my energy! So going to bed at 9:00pm has become the norm (ok so I’m using Bobo as an excuse to go to sleep early… shh!). As you can imagine, the family is overjoyed by the news. My parents are on their 6th grandchild, while my in-laws are on their 4th! So they’re pretty much experts at anything and everything that’s going on. The special treatment by the parents is a definite bonus! However, since my sisters just went through this, they’re not too sympathetic and usually respond to my questions with “you have no idea how much harder it’s going to get..” – really calming as you can imagine. Baby Daddy, Sach, is a mix of excited and terrified which makes this all that more fun! Finding out that we’re having a boy definitely let him breath a sigh of relief as his plan was to lock up a girl in her room till she was 18 and then home school her – lucky kid! Luckily I did not start showing too much during my first trimester so my wardrobe hasn’t changed much. Sure, everything became extremely snug, but thank goodness it’s summer time and I can get away with a dress every day! I also had a great, life saving find at Uniqlo – they have these “legging jeans” (no, not jeggings) that come in every color in the rainbow and most of all allow for my growth! They don’t look like jeans so I can get away with them at work too (when I’m not in court or on a deposition in which case – back to the dress!). Thanks for checking in on Bobo and Dipti. We will write to you next month with some more updates. Till then, be sure to leave us your comments and own experiences if you are going through or been through a preganacy. Dipti will take all the advice she can get and it will be nice to hear other’s experiences as well. Hey guys ! I stumbled upon your blog, and I’m happy I did. 🙂 Well, I’m pregnant too and you guys definitely give a great in sight to what my next days are gonna be like !! I find your ways interesting and quite like my own family. Okay, so I was wondering if you could help me with one small thing. Since I’m in my first trimester, I have started with my folic acid supplements. I use Pregnacare and we live in UK, so my doctor has advised to take these. Did you guys take any supplements , if you did, which ones did you take ? Hi Ashiti! Thanks for following us! And congrats on your pregnancy! Dipti was told to take Vitamin D and Iron supplements during her third trimester but not folic acid. All of our prenatal vitamins had folic acid in them so we didn’t need to supplement with it. Hope that helps and feel free to ask us anything else!